Aaron Striegel, associate professor of computer science and engineering at the University of Notre Dame, has been selected as one of the nation’s 65 most innovative young engineering educators. These early career faculty members, who have already been honored for their development and implementation of novel educational approaches in a variety of engineering disciplines, will participate in the National Academy of Engineering’s (NAE) 3rd annual U.S. Frontiers of Engineering Education Symposium. Scheduled for Nov. 13 to 16 in Irvine, Calif., this year’s program will focus on teaching leading-edge engineering knowledge, project-based learning, active and self-directed learning, and assessment of student learning and education innovation. Striegel, who was instrumental in the development of unique course materials involving the Nintendo Wii and programming new applications for physical therapy and rehabilitation efforts using low-cost gaming components, joined the University in 2003. His research interests encompass networking, computer security, accessible rehabilitation, and engineering education. His research has received multiple best paper awards from Institute of Electrical and Electronics Engineers (IEEE) Healthcom and USENIX LISA. 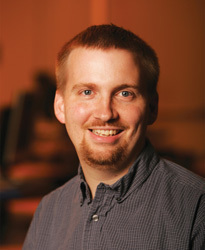 In addition to receiving the Faculty Early Career (CAREER) Award from the National Science Foundation in 2004, Striegel has received research excellence and teaching excellence awards from Iowa State University, a new faculty fellow grant from Frontiers in Education and a Notre Dame Computer Science and Engineering faculty award for teaching. He was recognized with an Early Career Award by the Iowa State Electrical and Computer Engineering Department in 2010. Striegel is also a senior member of IEEE and a member of the American Society for Engineering Education. Established in 1964, the NAE is an independent, nonprofit institution that serves as an adviser to government and the public on issues in engineering and technology. Its members consist of the nation’s premier engineers, who are elected by their peers for their distinguished achievements. Originally published by Nina Welding at newsinfo.nd.edu on November 10, 2011.